Engine manufacturer Cummins South Pacific has announced it will release its X15 Euro 5 next generation heavy-duty engine for the truck market in 2017. Replacing the 15-litre ISXe5, the new engine will be offered with the same horsepower ratings as the previous generation, from 450 to 600hp, and generate peak torque spanning 1,650 to 2,050 lb-ft. However, the X15 will add Advanced Dynamic Efficient Powertrain Technology (ADEPT) and Connected Diagnosis to the hardware and SCR technology found in the ISXe5. 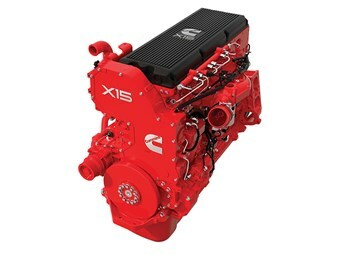 "The X15 uses the same hardware and emissions reduction technology – SCR – as the existing ISXe5," Cummins South Pacific managing director Andrew Penca says, "and incorporates all the product improvements since the ISXe5 release in 2012, including power cylinder, cylinder head and turbocharger upgrades." The addition of the ADEPT offering, which has been trialled in Australian conditions since early this year and works with Eaton’s 18-speed automated UltraShift Plus transmission, will improve fuel economy as it "utilises load, speed and grade-sensing technology to initiate adjustments to engine power, torque and transmission gear selection to take advantage of vehicle momentum," Cummins says. These improvements will be provided through two new features in the first ADEPT package: SmartCoast and SmartTorque. The former disengages the front box of the transmission, returning the engine to idle, while a truck is travelling a moderate downhill grade to reduce drag, maintain momentum and reduce fuel consumption. The gears are reengaged once the engine commands the transmission to be put back into action. SmartTorque on the other hand is about focusing on a fuel-efficient ‘sweet spot’. Using torque management intelligence to help remove unnecessary downshifts, Cummins says it keeps the engine running at its most efficient. The other major addition is the introduction of Cummins Connected Diagnosis, a telematics system that provides detailed information and expert advice to the operator should a fault occur. The automated process sends notifications from Cummins, via email, an app or the web portal, detailing probable root causes and the next steps an operator should take. Cummins says this offering will be bolstered "in the near future" with the addition of Over-the-Air (OTA) engine programming and customisation. The technology will allow engines to be reprogramed or updated without a visit to a service bay. Those waiting for predictive cruise control will not have to wait much longer either, as Cummins says it will join the ADEPT offering in the future. While it is slated for next year, industry sources believe the new X15 will make its first public appearance before then, arriving with an exciting new Kenworth model set for release in the next few months and scheduled to begin production at Kenworth’s Victorian Bayswater plant in February.